A satellite image of Lake Erie on Sept. 3, 2011, overlaid on a map of the lake and its tributaries. This image shows the bloom about six weeks after its initiation in the lake's western basin. On this date, it covers the entire western basin and is beginning to expand into the central basin. Map by Michigan Sea Grant. The largest harmful algae bloom in Lake Erie's recorded history was likely caused by the confluence of changing farming practices and weather conditions that are expected to become more common in the future due to climate change. Rather than an isolated, one-time occurrence, Lake Erie's monumental 2011 algae bloom was more likely a harbinger of things to come, according to University of Michigan researchers and colleagues from eight other institutions. The interdisciplinary team explored factors that may have contributed to the event and analyzed the likelihood of future massive blooms in the lake. "Intense spring rainstorms were a major contributing factor, and such storms are part of a long-term trend for this region that is projected to get worse in the future due to climate change," said aquatic ecologist Donald Scavia, director of U-M's Graham Sustainability Institute. "On top of that we have agricultural practices that provide the key nutrients that fuel large-scale blooms." A paper summarizing the team's findings is scheduled for online publication April 1 in the journal Proceedings of the National Academy of Sciences. The first author of the paper is former U-M researcher Anna Michalak, now at the Carnegie Institution for Science. Eighteen U-M co-authors from various departments and schools contributed to the study, which looked at land use, agricultural practices, precipitation, temperature, wind, lake circulation and surface runoff. "This event was caused by a complex combination of factors, and I think this paper really puts all the pieces together in a very clear and systematic way," said U-M atmospheric scientist Allison Steiner, one of the co-authors. "We tried to think about this problem in a much more cross-disciplinary way than I think other people have thought about it before." The researchers found that a series of intense spring rainstorms and runoff events resulted in record-breaking levels of phosphorus, a nutrient in crop fertilizers that also fuels rampant algae growth, washing into western Lake Erie. A Lake Erie algae bloom in September 2009. This photo was taken on the southeast shore of Pelee Island, Ontario. Credit: Tom Archer. That set the stage for an algae bloom that covered about 2,000 square miles by the time it peaked in early October 2011. 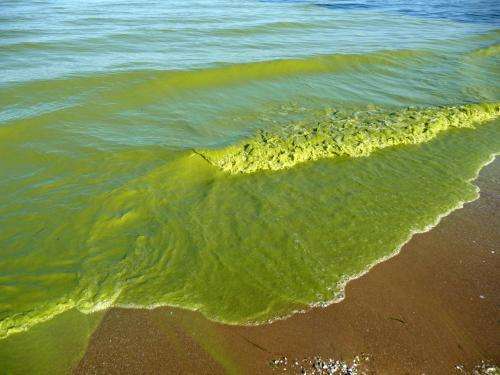 That's more than three times larger than any previously observed Lake Erie algae bloom, including blooms that occurred in the 1960s and 1970s, when the lake was famously declared dead. The 2011 spring storms included one that dumped 2 inches of rain over Ohio's Maumee River basin in 24 hours on May 26 and 6.8 inches total for the month of May 2011—more than 20 percent above the long-term monthly average. The Maumee is a primary tributary to western Lake Erie, and it drains an agricultural watershed where corn, soybeans and wheat are grown. In their study, the researchers used 12 computerized climate models to determine if rainstorms like the May 2011 events are more likely to occur in the future. The models, which incorporate the anticipated effects of human-caused climate change due to the buildup of heat-trapping greenhouse gases, showed that the frequency of spring rainstorms that drop more than 1.2 inches is likely to double in this region by the end of the century. "The models do predict an increase in extreme springtime precipitation events, and that's driven by an increase in greenhouse gases," said Steiner, an associate professor in the Department of Atmospheric, Oceanic and Space Sciences. Once the 2011 Lake Erie bloom formed, unusually warm water temperatures and calm winds created ideal conditions to promote summer algae growth. "All of these factors are consistent with expected future conditions," the 29 authors of the PNAS paper wrote. An algae bloom is a rapid buildup of algae in a body of water, and harmful blooms are those that damage other organisms—including humans—through the production of toxins or by other means. Algae blooms can foul harbors, clog boat motors, reduce fish populations and sometimes lead to the formation of low-oxygen "dead zones" where most aquatic organisms cannot survive. 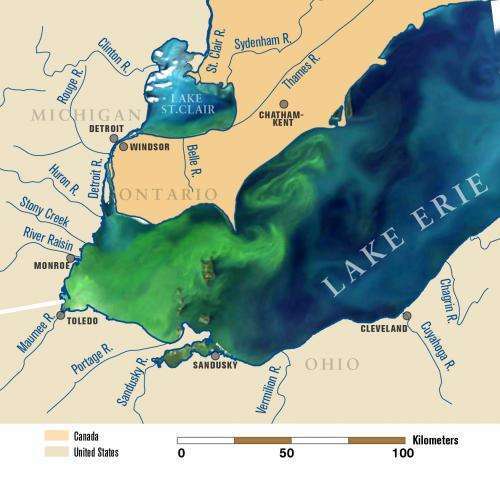 The 2011 Lake Erie bloom was composed almost entirely of toxic blue-green Microcystis algae. Concentrations of mycrocystin, a liver toxin produced by the algae, peaked at about 224 times World Health Organization guidelines, according to the researchers. In addition to meteorological conditions, other factors contributed to the 2011 Lake Erie algae bloom. Chief among them is the widespread adoption, since the mid-1990s, of no-till farming and other agricultural practices that have increased the availability of a type of phosphorous, known as dissolved reactive phosphorous or DRP, that promotes algae growth. In no-till farming, crops are planted without plowing by inserting seeds into small holes. The technique reduces erosion but leaves high levels of phosphorous-bearing fertilizer in the upper surface soil, where heavy rainstorms can wash it away. Trends toward autumn fertilizer application and surface broadcasting of fertilizers also create conditions for enhanced phosphorous runoff. Unless there's a significant shift away from these practices, runoff from farmland in the Maumee River watershed and other Western Basin watersheds will likely continue to provide the nutrients needed to trigger massive Lake Erie algae blooms. In addition, the current emphasis on producing corn for ethanol production, as well as a trend in the Midwest toward declining acreage reserved for conservation purposes, is likely to exacerbate the problem, said Michael Moore, a professor of environmental economics at U-M's School of Natural Resources and Environment and one of the paper's co-authors. "Corn is the crop on which phosphate-based fertilizer is most heavily applied," Moore said. "So the intensification of corn production is a problem, and part of the solution would be to rethink this emphasis on corn production for biofuels." More information: "Record-setting algal bloom in Lake Erie caused by agricultural and meteorological trends consistent with expected future conditions," by Anna M. Michalak et al. PNAS, 2013. Lake Erie's monumental 2011 algae bloom was more likely a harbinger of things to come, according to University of Michigan researchers and colleagues from eight other institutions. UofM and 8 other institutions! That there conspiracy is sure getting big! How does Gore do it? and make fuel out of it. Cold be better than using corn? There is no "climate change" it's merely the natural cyclical shift of highs and lows from region to region. Even the authors of the "global warming" fraud in the UK are beginning to acknowledge this - science is. @pres68y - unfortunately this bloom was a toxic species. But it does look thick enough to be potentially harvestable for energy. While poisoning the great lakes for this would be destructive, if it happens anyway it could be used as practice for farming the oceans. "IF" we could harvest this algae and "IF" it's not toxic to burn. I would much rather burn pelletized algae that corn. Mark Twain pointed out "There's nothing unusual about unusual weather." including blooms that occurred in the 1960s and 1970s, when the lake was famously declared dead. So what human induced global warming/climate change occurred in the 60s and 70s pray tell. What is it about a science site that makes people with a grade 6 education think they can post garbage like this? What stupidity would cause a person to post "natural cyclical shift of highs and lows from region to region" like its some new thing not thought of and discussed on a hundred different sites and in a thousand different papers by people who actually understand how science works? And then againstseeing tosses in another dud of complete misunderstanding in some sorry attempt to misdirect the findings set out in the article. Is there something about this site that invites stupid? I could understand the Turds who sink to the bottom and in the darkness remain ignorant, but magganusTurd obviously floats continuously at the top and has yet to see the light. The light of conspiracy againstseeing? You're right, I think your idea that there is a conspiracy is too stupid to see daylight. So what do you think you linked to? Can you even begin to explain the meaning of the NWS site you've linked? The link shows the varying crests of the Maumee River over the years. However, for this study, May 26 2011 makes for climate change and global warming bloom and gloom. Ok, one aspect of several considered by the researchers for this particular incident. The article even says it was the result of "a complex combination of factors". Global warming is one aspect, as are farming practices, and fertilizing practices, and the timing of the storm, and the type of crops planted. So what do you see as the problem? The algae are toxic (as noted in the article). Harvesting them for biofuel might be a better option. if it happens anyway it could be used as practice for farming the oceans. Harvesting the oceans would probably not work, as the stuff disperses too rapidly there. This only works in lakes where there are no (appreciable) currents. "IF" we could harvest this algae and "IF" it's not toxic to burn. Burning gives you CO2 and H2O. There's really no biological matter that will give you much of a toxic substance when burned (properly). So what do you see as the problem? When the historical record show widely varying flow into the lake over the last century and blooms during the 60s and 70s when, going back to my original question, what global warming was happening? No ideas are banal and why some egos take umbrage at other ideas i'll never understand. Of course you meant to ask, "why did they concentrate the conclusions of their study on this one spring." The answer: because the combination of factors over the spring of 2011, which included a particular day in May that is an example of that springtime trend, gives a good example of the overall trend. Of course, the say that in the article, if you would take the time to READ IT! Different era, different causes. And it was warming then too, it just wasn't generally recognized. The human induced change to Lake Erie in the '60s and '70s was phosphates in laundry detergents. Dispersal by current depends largely on the area of the bloom. Nature's huge ocean blooms stick around for weeks or even months. But huge blooms would be risky to start with, so practicing on an already-blooming lake would be a sensible start. Also blooms of non-toxic species would be better, and in a lake it would be easier to experiment on changing the nutrient mix to produce a species edible by fish. Again an already-blooming lake would be a good place to start. Also blooms of non-toxic species would be better, and in a lake it would be easier to experiment on changing the nutrient mix to produce a species edible by fish. Blooms tend to decrease oxygen content in the water (dead algae unergo bacterial decay which consumes oxygen). Even if edible to fish, fish won't survive in the vicinity of a bloom. Causing a bloom is really not a good idea if you want to keep an evene remotely stable/varied ecosystem alive in the lake.